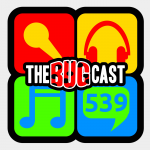 This week on The Bugcast: a 50th birthday, Butch Cassidy’s screenwriter dies, Dave remembers a song, and we play 8 tracks of Creative Commons music! It’s JohnFromCanada’s 50th birthday today! When is a Loaded Gun not a Loaded Gun or perhaps it is or not? The next show will be episode 540, which will be streamed live in the chatroom on Friday 23 November 2018 at 21:30-ish UK time (GMT/UTC).